Nero Burning ROM by Ahead is a versatile piece of software. It allows you to create VideoCD's of your photo collection as well. In this short guide I'll show you how to create your own Photo-VideoCD, which you can playback on your PC and on most standalone DVD-players. Tip: If your DVD-player support the use of Super VideoCD, then you might want to consider using that format since it offers a higher resolution to your images! See Photo Super VideoCD for details. Tip: You can also add movie fragments to this VideoCD as well! Tip: When using the menu's in Nero, note that there is a limitation of 99 photo's on a CD. If you do not use the menu's, then you will have no limitations on the number of photo's. Naturally one needs photo's to be able to add them to a VideoCD. You can add 1 or more photo's and even add video fragments - mixing is allowed! For foto's you can use basically any common file format, like: GIF, BMP, JPEG, TIFF and PNG. For video fragments one needs to use MPEG1 files, matching the VideoCD standard, see "VideoCD with Nero" for details. Tip: In case you the happy owner of a digital camera, like the Sony Cybershot 707, then you can use the recorded MPEG files directly to add to your Photo-VideoCD compilation. Just make sure you first copy the file to your harddisk since access to these files is faster. For the rest of this tutorial I'm assuming you're about to make a PAL VideoCD. The only differences with an NTSC VideoCD is the option "NTSC" (USA) instead of "PAL" (Europe) and the MPEG1 movie format used as mentioned above if you want to add video fragments. It is possible to create a Photo-VideoCD without the use of a menu, however, in order to quickly navigate the CD (and find the photo you're looking for), a menu is advisable. So if you are about to create a VideoCD with menu's, please check the option "Enable menu". Set as default Allows you to make Nero save these settings so the next new VideoCD will be started out with the same settings - ideal when you are creating a serie of VideoCD's.. In the field "Volume label" we can now enter the title of our Photo-VideoCD. Usually it's a straight forward name. Tip: If a photo collection spans multiple Foto-VideoCDs, I usually end the title with "_AOFB" where A equals the disc number in the sequence and B equals the number of discs in this set. I usually set the date here to "Use current date and time" for my personal reference, however the default setting will do just fine. Alternatively you can enter a specific date indicating for example that this is the photo's are of your holiday of June 2001. 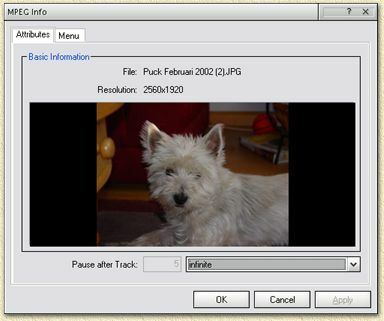 Use drag and drop to place a photo files (usually JPG, JPEG, BMP or TIFF) as shown below. 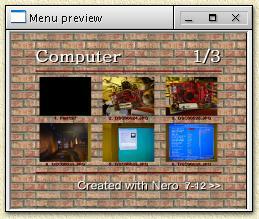 Drag and drop can be used with the buildin explorer of Nero or using the Windows Explorer (by draging a file from the Windows Explorer to Nero). You can add as many photo's as you like. The order shown in the window pointed by the red arrow as seen in the screenshot above, will be the playback order of your photos. You can change the order using drag and drop within this little window. Note: Sometimes, when you dragged a illegal photo format to the track section, you will get an error message. Make sure you're dopping the right files! It is best to use JPEG of TIFF formatted pictures. We can set the "pause" time before the playback continues with the next photo. At "Pause after Track" one can choose "Infinite", where playback does not continue to the next movie unless the user tells him to do so, or a specified number of "Seconds". The tab "Menu" allows you to change the title for this item. You will need a capable DVD playback program to play this CD! Some DVD playback programs do not even support this format! Don't forget: a copy of the original image files are stored in the CD-folder PICTURES.